On June 6, 1970 the Society for a Christian Commonwealth, which published Triumph, and the "Sons of Thunder" under the leadership of (Frederick "Fritz") Wilhelmsen and (L . Brent) Bozell, conducted "the Action for Life," which was probably the first anti-abortion demonstration in the United States. 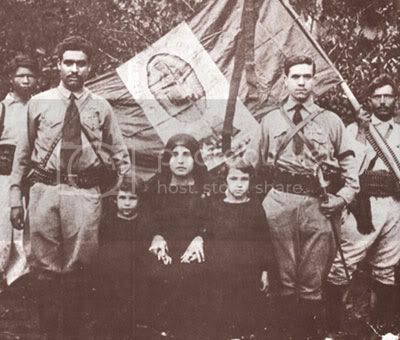 Fritz, students from the University of Dallas, and others appeared on the scene dressed like Spanish Carlists, or requetes, with red berets, khaki shirts with Sacred Heart patches, and rosaries around their necks. Wilhelmsen, brandishing a twelve-inch crucifix, read from Matthew 25 and the Book of Revelation, warning America that it must someday face God and receive judgment for the killing of its children. If we are to understand what is at the heart of the Catholic Right's agenda, then we must understand Carlism, one of the preeminent political philosophy in Spain from the 1830s through the reign of Franco's regime. Carlism is a political philosophy originally developed to help reestablish the Bourbon monarchy in Spain. First emerging as political force in the 1830s, it was primarily a reaction to the increasingly progressive rules of Charles III (1759-1788) and Charles IV (1788-1808), notably the latter's pressure on the Church to sell its property for government revenue. Similar events continued to created tension between the monarchy and the Church. As Spain became less theocratic forces such as the Carlists, among others, engaged sometime violent struggles to impose a Bourbon monarchy that would bind the church and state as one. Between the 1830s and the Spanish Civil, five separate Carlists made claims to the Spanish throne (the Carlist label is derived from followers of Don Carlos, son of Carlos IV who initially challenged the non-salic ascendancy of Isabella II to the Spanish throne in 1833). Its efforts cumulated in the fascist-instigated Civil War lasting from 1936 through 1939. While there are variations of this political philosophy two of its common hallmarks should stand out to those who are concerned about theocratic trends in the world. First, it sees ultra-orthodox Catholicism as the cornerstone of the state. Secondly, sovereignty is vested not with the people, but with a monarch, who in turn is answerable only to the Catholic Church. Whether it be full-blown Carlists or those whose political vision is only influenced by it, these are the two commonly held themes that appear in their various pronouncements. Carlism has had varying influence on different members of the Catholic Right. Its truest adherents are found in groups such as Tradition, Family and Property and individuals such as Dr. Alexandra Wilhelmsen. Although not full-blown Carlists or even identifying themselves with the Carlist name, its influence is clearly present in the elitist writings of theoconservatives such as John Neuhaus, Robert H. Bork and to a lesser extent, George Weigel. These common attitudes of "struggle," "religious unity" and "church independence"--something more progressive Catholics view as a lack of accountability--are infused into much of the leadership of the more extreme elements of the Catholic Right. They were clearly apparent forty years ago when L. Brent Bozzell roared, "The Catholic Church in America must forthrightly acknowledge that a state of war exists between herself and the American political order" or when Institute on Religion and Democracy Board member John Neuhaus openly questions the legitimacy of American government because of its pluralism and when Robert H. Bork in his book Slouching Towards Gomorrah bemoans Thomas Jefferson and the Declaration of Independence. Esoterically, what today's Carlists or neo-Carlists are saying is that they want a society where even non-Catholics are bound by their subjective, but ultra-orthodox interpretations of Thomistic morality. Dr. Alexandra Wilhelmsen's quote is telling for several reasons. First and foremost is her description of Franco's Nationalist forces, with its Nazi and Fascist benefactors, as "liberators." But it also illustrates the inconsistency in Carlist-inspired orthodoxy. For example, many in this school, from Donald D'Elia to Romano Guardini to Robert H. Bork--much like their more secular Straussian brethren--warn of Nazi-styled nihilism pervading modern society. Yet in idealizing Franco's Spain they fail to recognize how both Hitler and Mussolini played vital roles in establishing a Falangist regime on the Iberian penninsula. It is this last characteristic that is most troubling. As The New Republic's Jacob Heilbrunn noted, "...by and large, Catholic conservatives, like conservatives in general, chose Buckley's way, not Bozell's. "(v) But there still exists among theocons such as John Neuhaus the pre-Vatican II belief that all faiths other than Catholicism are erroneous and that the liberties of these other faiths should not be protected equally. A variation of this theme is now being played out by Opus Dei cooperator and Legatus founder Thomas Monaghan in his planned Ave Maria Florida community. Much like Franco's Spain, orthodox Catholic teachings, not the will of the people will be the final word on public morality. But nowhere is this attitude is taken to greater extremes than with the group known as Tradition, Family and Property. TFP is a colorful group that goes well beyond Opus Dei. The organization's emblem even incorporates Carlist symbols such as the golden lion. Its members can be seen in their characteristic red shawls and medieval-styled banners on some college campuses and the annual Conservative Political Action Conference (CPAC). Its members are openly scornful of liberal democracy citing the Renaissance, the Reformation and the Enlightenment as the events that caused the fall of society. Their remedy is "the preferential for the nobility. It is simply impossible to be more reactionary. And much like Neuhaus, Bozell and others of the Catholic Right, TFP advocates chivalry and manliness--something eerily similar to teachings of neoconservatives such as Harvey C. Mansfield. Similar to fascism, Carlism, TFP and others on the Catholic Right desire a theocratic world where the individual is not measured by either the merit of his efforts or his good citizenship, but more by birthright and subjective belief. The undemocratic belief of Church and state as one began eroding within official Catholic teachings with the onset of the Second World War. One of the primary heroes in doing away with this archaic concept was John Courtney Murray, S.J. Although personally conservative on many Vatican teachings, Murray wrote for the Jesuit periodical America understood that secular society does not erode religious liberty but in fact guarantees it. To this end, Murray believed that the liberties of all faiths should be equally protected. Murray came to his view in light of the rise of racist variants of fascism in Germany, Italy--and Spain in the run up to World War II. He fully understood that in the war Americans and many others were giving their lives to preserve the true meaning of religious freedom. And t that end, he came to believe that the Catholic Church could be more effective in its advocacy by engaging in the democratic process rather than trying to suppress it. For his troubles the Vatican censored Murray, refusing to allow him to publish any religious tracts. This occurred during the period aptly described by Garry Wills as "the silent terror," which prevailed during the papacy of Pius XII. But with the aggiornomento or openness of Pope John XXIII's Vatican II, Murray's ideas took root in mainstream Catholic thought. The result of this sea change was Dignitatis Humanae. In what could be considered one of the greatest victories over the forces of reaction, it proclaimed that everyone has a right to religious liberty, a right that is grounded in the essential dignity of each individual. While the Church still viewed itself as the vessel of "the truth," it wisely concluded that individuals must be free to seek the truth without coercion. That is still the official teaching of the Roman Catholic Church. Yet as illustrated above there are nefarious forces working within Catholicism to return it to a new reign of terror." They will utilize membership in groups such as Opus Dei to effect this change with the church while using vehicles such as the Institute for Religion and Democracy to do the same within other denominations. For those who would have Americans bow before monarchs, only the obvious need be stated: we abrogated such loyalties at Yorktown more than two hundred years ago. Similarly, for those who would make us subject to "benign" tyrants, history has demonstrated that there is no such thing. Tyrants by their very nature are far from benign. It is why we stood up to the likes of Kaiser Wilhelm, Hitler and Stalin. But we must once again return to admonition of Jesuit priest Wilfred Parsons: "'The great tragedy of Spain was that in the nineteenth century the working masses apostatized from the Church, as Pope Plus X once remarked. And, it is well to remember, it was poverty, destitution and injustice which made them apostatize. They got to hate the Church because they hated the friends of the Church, who exploited them and whom the Church did nothing to rebuke or correct." Among those hated "friends of the Church" described by Parsons were the Carlists and other pompous plutocrats who place their exalted position on Earth well above the common good. And while many on the Catholic Right are not calling for a return to monarchy, they are influenced by the Carlism's core notion: a nation answers not to the will of a pluralistic people, but to the will of Vatican law. It is at the heart of George Weigel's recent declaration, "Europe's crisis of civilizational morale teaches us that, while there are many lenses through which history can be read, theological lenses help us to see deeper, farther, and more truly." (vi) When Weigel speaks of "consent" he is more concerned with religious authority than with vox populi. Unfortunately, Carlism's American heirs--George Weigel, Thomas Monaghan and John Neuhaus--all believe in a society not built upon the meritocracy of the common citizen, but of one that unjustly gives deference to birthright and privilege. If they were ever to succeed it would end the noble experiment of American democracy as generations have known it. Then the last best hope for mankind would take a giant step back into the Dark Ages. And that is just what the Carlists want. (iii) The citing of Belloc by the current Catholic Right exposes further hypocrisy on their part. While Belloc advocated orthodoxy, he also advocated Distributism economics--a key feature of New Deal economic policies. Obviously, this is one feature of Belloc's teachings that are conveniently ignored by the Catholic Right, the very thing that makes them "Smorgasbord" Catholics. (iv) D'Elia, Donald, Citizen of Rome: Frederick D. Wilhelmsen, citing "Hallowed Be They World," page 143. (v) "Neocon vs. Theocon: The New Fault Line on the Right," The New Republic, posted, December 12, 1996 . Link: http://web.archive.org/web/20010914000605/http://www.tnr.com/arch ive/1996/12/123096/heilbrunn123096.html Heilbrunn does go on to overstate the importance of Roe vs. Wade, by claiming it significantly radicalized American Catholic conservatives. While some conservative Catholics did become hardened in their orthodoxy, such a reaction is more the exception than the rule. (iv) Weigel, George, "Europe's Problem--and Our's"; First Things 140 February 2004, pages 18-25. These extremists are not the face of the true Catholic Church. Instead, they are politicos who are using the sanctity of faith to destroy the value pluralist nature of our democratic society. Thanks again for another excellent installment. Sometimes I get frustrated at the reactionaries that seem to be in charge of the Church. I don't know if you've read it yet, but this echoes some of what John W. Dean mentions in his book Conservatives Without Conscience. I plan on reading John Dean's book next. Right now I'm plowing through John Allen's book on Opus Dei for an upcoming CR column. This diary helps me fill out my understanding of 19 th century religion. I have reasonable knowledge of the history of progressive Roman Catholicism but little or none of conservative Roman Catholicism. We tend in the US to look only at Protestant religious movements but we really can't completely understand the ebb and flow of historical religious tides without understanding Roman Catholicism as well. Unfortunately, many mainstream Catholics are not even aware of these movements within the church. If they ever do become aware of them, it would help preserve religious liberty in America. I am much more familiar with Christian fundamentalism, having been raised in a fundamentalist church, than Catholic fundamentalism so this article gives me some good information to use in future research. I have for some time now thought that mankind is once again on the verge of a huge change, one that will lead us either into a new enlightenment, or into a new dark ages. It is up to us, the people, as to which direction we take. Great info! I recently came across your blog and have been reading along. I thought I would leave my first comment. I don't know what to say except that I have.